Simple, fast and hygienic floor cleaning with minimal disturbance. 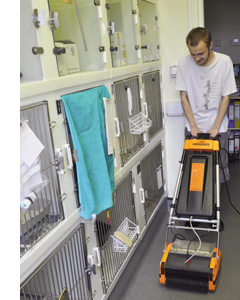 Our machines quickly and hygienically clean just about any floor surface used in animal care: quarry tiles, lino, concrete, rubber, resin, wood, carpeting and even all slip resistant coverings, helping to maintain a safe and sanitary environment for veterinarians and the animals in their care. Why buy Rotowash for your Veterinary Practice? After 10 yrs in practice our Altro floor was suffering a lack of care and attention that no amount of hands and knees scrubbing could resolve. We scheduled a demo of the Rotowash machine and it was obvious this would do the job we needed. We had assistance assembling the Rotowash from the company and training for everyone on day one. Our floors have never been so clean, the nurses have never been happier and I am confident it will continue for at least another 10 yrs.